Last year's Marme Monlam has a good claim on the title of ultimate Dharma-fest, with its diversity of performers from Taiwan, China, Bhutan, Mongolia, UK and India, and its sensational rock-guitar-duel morphing into the chanting of Karmapa Khyenno. This year's celebration, given the absence of the Gyalwang Karmapa, promised to be a rather more subdued affair. But the highlight of the event, the Lamp Prayer and the offering of lights, brought out as much heart as always in all the participants. The Kagyu Monlam Pavilion housed, on this final evening, as good a turnout as during any of the days of the Monlam just concluded, and included, moreover, special guest Sangha from other Buddhist monasteries. Participants were given a clay diya holder with a tealight when they arrived, and directions as to when the moment would be to light them for the offering. As usual, the stage had been stripped of almost all the Monlam decorations, only the tormas remaining either side of the Buddha's statue; the thangkas of the Golden Rosary had likewise been removed from above the central aisle. The evening’s proceedings started with the arrival of Gyaltsap Rinpoche, who took his seat in the centre of the assembled Sangha with Yongey Mingyur Rinpoche, who joined him shortly. This was not an evening for long speeches. The three MCs - speaking respectively in Tibetan, English and Chinese - greeted Gyaltsap Rinpoche and Yongey Mingyur Rinpoche, foremost amongst khenpos and lamas; welcomed the representatives from government and Buddhist organisations in the Gaya district who were present; and briefly guided the Monlam assembly through the evening’s programme. “The Buddha is the unsurpassable Teacher, the Dharma is the unsurpassable Refuge, the Sangha is the unsurpassable Guide …” With this hallowed affirmation of the Three Jewels, the MCs introduced the Marme Monlam, the Kagyu Monlam’s concluding event, as the Monlam’s realisation of “virtue in the end”. The three performances that followed were, indeed, a remarkably self-contained Dharma offering. First, the nuns from the Drupde Palmo Chokyi Dingkhang Nunnery in Bhutan sang A Melody of The Three Jewels. Then, the Kagyu Monlam chanting masters - three of the monks and three of the nuns who had been umzeing throughout this Monlam - chanted the Avalokiteshvara practice Benefitting Beings Throughout Space, a now traditional Marme Monlam sadhana. There were only six voices, but what powerful six voices they were, and the mix of male and female umzes made it more so. Following that, the nuns from the Drupde Palmo Chokyi Dingkhang Nunnery returned, together with the monks of the Vajra Vidya Institute of Thrangu Monastery, for a rendition of A Joyful Aspiration, a poem composed by the Karmapa. It was delivered, on this occasion, to a subtle, yet haunting, musical accompaniment. The MCs thanked all the performers for singing so beautifully and leading everyone in prayer, and introduced the Marme Monlam proper, the Lamp Prayer. This was chanted along to a video recording of last year's Prayer, led by the Karmapa, in the three languages, under the protective blessing of the golden Buddha statue especially installed at the time. And everyone joined in. Lighted diyas were held up with a palpable, joyful uplift, expanding hearts and swelling the shared song. This mood was presciently captured by the MCs in their concluding words, when it was pointed out that the Karmapa’s not being able to join in person had, in the end, made no real difference in terms of his loving advice and direction for the Kagyu Monlam. It had been possible, the MCs underlined, to bring about virtue in the beginning with the Pre-Monlam teachings of Gyaltsap Rinpoche and the meditation instructions of the Lord of Refuge, Yongey Mingyur Rinpoche; to establish virtue in the middle throughout the seven days of the Kagyu Monlam; and to bring it to a close with the reiterated virtue in the end of the Marme Monlam. As a final gesture, participants were asked to take their diyas outside and make designs with them. 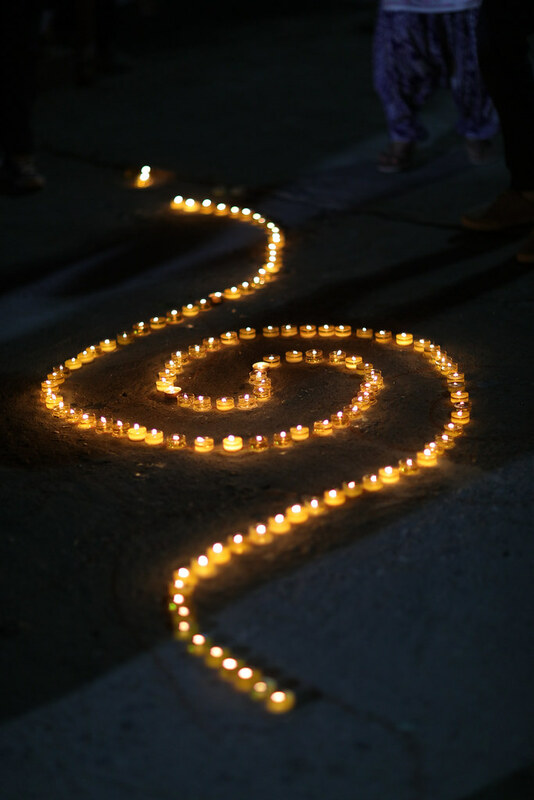 The result was an avenue of lights, like so many sparks of the Buddhadharma that participants were sure to take with them, as they started their return to their ordinary lives.